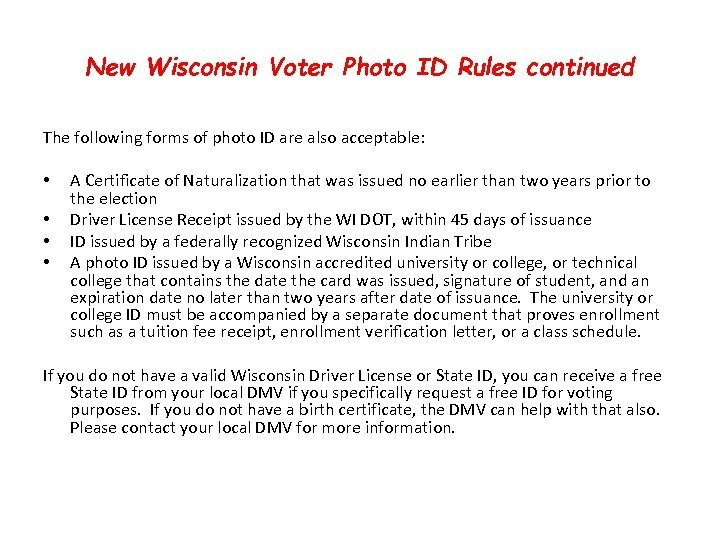 New Wisconsin Voter Photo ID Rules continued The following forms of photo ID are also acceptable: • A Certificate of Naturalization that was issued no earlier than two years prior to the election • Driver License Receipt issued by the WI DOT, within 45 days of issuance • ID issued by a federally recognized Wisconsin Indian Tribe • A photo ID issued by a Wisconsin accredited university or college, or technical college that contains the date the card was issued, signature of student, and an expiration date no later than two years after date of issuance. The university or college ID must be accompanied by a separate document that proves enrollment such as a tuition fee receipt, enrollment verification letter, or a class schedule. 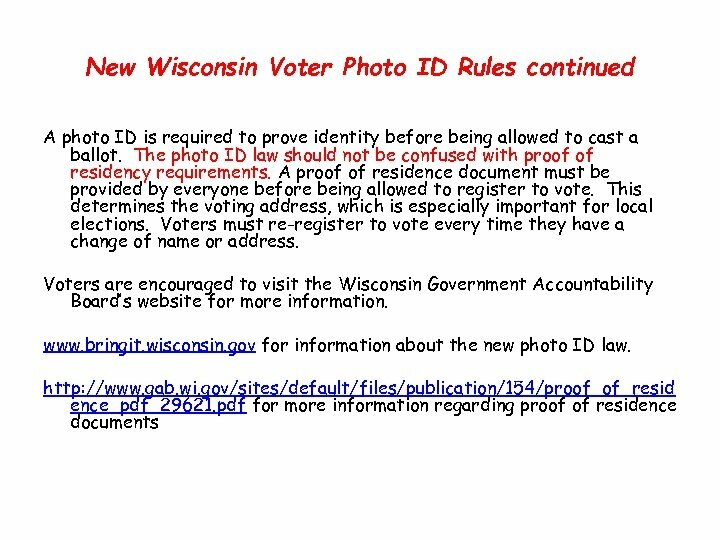 If you do not have a valid Wisconsin Driver License or State ID, you can receive a free State ID from your local DMV if you specifically request a free ID for voting purposes. If you do not have a birth certificate, the DMV can help with that also. Please contact your local DMV for more information. 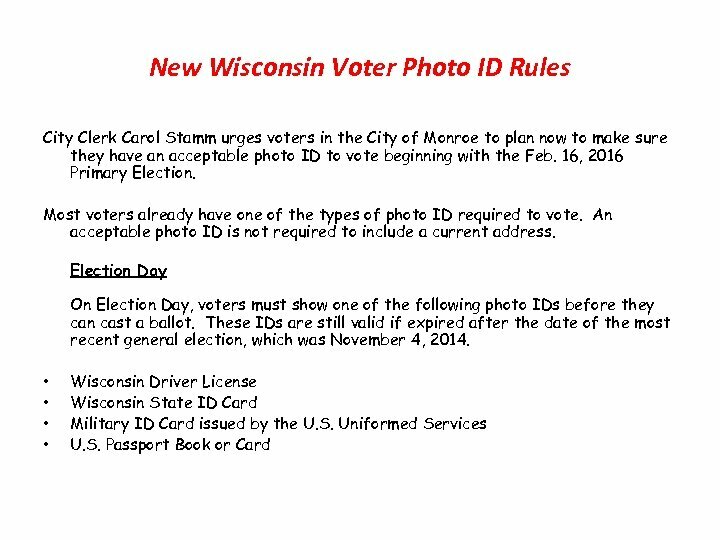 New Wisconsin Voter Photo ID Rules continued Absentee Voting During in-person absentee voting, voters must present photo ID just like on Election Day. When voters request an absentee ballot by mail, they must include a photocopy of their photo ID with the request. 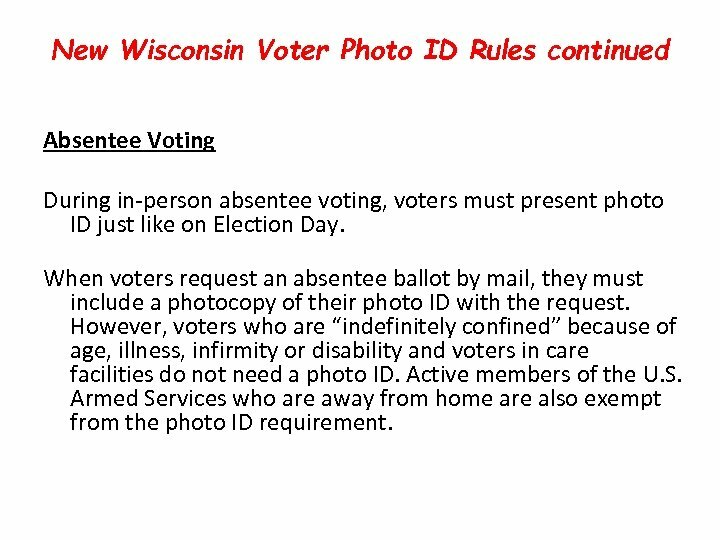 However, voters who are “indefinitely confined” because of age, illness, infirmity or disability and voters in care facilities do not need a photo ID. Active members of the U. S. Armed Services who are away from home are also exempt from the photo ID requirement.